The Rollekonter (ロールコンター) is a Japanese 6×6 TLR made from early 1938 to 1944. The name is an obvious rip-off of Rolleiflex and Ikonta (イコンター in Japanese). The camera was made by Mori Seisakusho. It was distributed by Ōsawa, Yamashita and Seibidō, then by Mizuno and Hakkōdō. After 1945, the camera was succeeded by the Bikor-Flex. The Rollekonter was inspired by the 1936 Rolleicord models. All the models share the same body casting; it is said that this part was re-used after the war on various other TLR cameras, perhaps because the dies survived and were used by some sub-contractor supplying parts to other manufacturers. The camera is focused by moving the front plate back and forth. The focusing and film advance knobs are on the photographer's right. The film advance is semi-automatic and there is a round exposure counter window at the top of the right-hand side plate. The focusing knob is inscribed Rolle Konter Work, a mere dummy name (see Camera Works). The distance scale is engraved on the side of the knob, usually on a black background. It is surrounded by a metal plate, either chrome or black, looking like a depth-of-field scale but only engraved Rolle konter. The viewing hood is made of two parts only. The front part usually has a logo in the middle, reading K&T. This logo is read from behind when the hood is closed, and it appears upside down when it is open. There is a mirror inside the hood, released by a lever visible on the right. It is used for eye-level focusing through a round eyepiece on the rear. There is also a magnifying lens hinged to the rear, above the eyepiece. The back is hinged to the top for film loading. There is an exposure table in English language attached at the rear. (The table is exactly identical to that of the First Reflex, and it seems that these cameras share other parts too.) There is a red window under the camera, on the left-hand side, next to the tripod thread. It is protected by a sliding cover and is used to set the position of the first exposure. All the models have a 75mm lens called Hitonar Anastigmat or U Hitonar Anastigmat. The name Hitonar (ヒトナー) probably refers to Hitler (written ヒトラー in Japanese). An original document lists the U Hitonar 75mm f/3.5 as a three-element lens made by Kokusaku. At least one recent source says that the Hitonar was made by Miyoshi Kōgaku; this may be a mistake or might indicate that the supplier was changed at some point. The case is made of brown leather and is embossed Rollekonter or Rolle Konter at the front. The original Rollekonter has the first type of advance mechanism. It automatically stops after each exposure, and reportedly provides double exposure prevention. There is a lever in front of the wind knob, with O and R indications, perhaps used to unlock the film advance after each exposure. It seems that the central part of the wind knob is fixed, unlike the contemporary Rolleicord. Other details of the mechanism are unclear, and it is not known how the exposure counter is engaged or reset. The camera has a latch at the rear of the viewing hood, unlike the later model II. The Rolle konter plate around the focus knob is usually black, as well as the back latch under the camera. The viewing lens has f/3.2 maximum aperture, unlike later models. The early cameras are recognized by the small nameplate, only inscribed Rolle konter in two words. The lens is a Hitonar Anastigmat 75mm f/3.5. The shutter, advertised as a Tokyo Compur (トーキョーコンパー), provides T, B, 1–300 speeds. This is not a genuine Compur but a Japanese copy made by Bikōdō. The shutter plate has an MB logo and is engraved Compur on one side. The name Rolle konter appears on a separate plate on the other side, attached by two screws. The shutter is wound and tripped by a single lever at the bottom. At least two surviving examples are known with the original nameplate, including that pictured in McKeown. The original Rollekonter was first advertised in Asahi Camera January 1938 and was featured in the new products column of the same magazine in February. 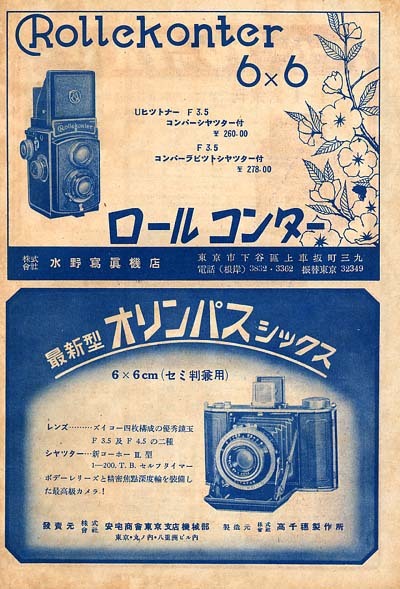 The June 1938 advertisement in Asahi Camera shows a picture of the camera with the early nameplate, merely called "Rollekonter". Three authorized dealers are mentioned: Ōsawa Shōkai, Yamashita Yūjirō Shōten and Seibidō, and no other company name is given. Hitonar Anastigmat 75mm f/3.5 taking lens no.6226. U Hitonar Anastigmat 75mm f/3.5 taking lens no.7575. The original model soon received a larger nameplate, shaped like that of the Rolleicord, marked Rollekonter and MADE IN TOKYO with no mention of a model number. It was renamed Rollekonter I after the introduction of the Rollekonter II in mid-1940, and was advertised until April 1941. No original document showing the camera with the larger nameplate has yet been found, but various surviving examples are known. At least one camera pictured in Sugiyama still has the Hitonar Anastigmat f/3.5 taking lens (that particular camera has a non standard back latch, probably not original). Most other examples have the newer U Hitonar Anastigmat f/3.5, with lens numbers in the 7xxx and 8xxx range. The viewing lens is either a Hitonar Anastigmat f/3.2 with a serial number, or a U Hitonar Anastigmat f/3.2 with no number. Most cameras have the "Tokyo Compur" shutter (T, B, 1–300) with MB logo. Others have a shutter giving T, B, 1–500 speeds, engraved COMPUR–RAPID on the rim. This shutter was made by Bikōdō too, and was advertised as the "Rapid-Compur" on later models of the Rollekonter, but does not appear with the Rollekonter I on the original documents. The front plate is normally similar to that of the "Tokyo Compur", with an MB logo and Rolle konter nameplate. The example pictured on the right has the "Compur-Rapid" but lacks the MB logo, and has a non original synch socket and a separate setting lever, perhaps the result of a repair. Another camera with the "Compur-Rapid" has a KODAK shutter plate, certainly because the part was replaced at some time. An isolated camera is known with a rounded casing around the taking and viewing lenses, completely covering the shutter. There are three levers on the sides of the casing, certainly to set the speed and aperture, and for shutter cocking and release. A black plate is screwed between the two lenses, with the words ROLLE KONTER WORK, and the camera lacks the K&T logo at the top. The rest of the camera body, including the film advance mechanism, is the same as on the Rollekonter I with large nameplate. The taking lens is a U.Hitonar with a low serial number (no.1419), and the viewing lens is a Ricoh Anastigmat. The camera is extremely similar to the original Ricohflex made from 1939 by Mori Seisakusho for Riken, which only differs by its Ricohflex nameplate, RIKEN KOHGAKU KOGYO CO., LTD. marking and Ricoh Anastigmat taking lens. That particular Rollekonter camera has been presented in recent sources as a "Rollekonter III", but this is probably a mistake. (The Rollekonter III was sold at a later period and was surely based on the Rollekonter II with the newer film advance mechanism.) It is actually a variant of the original Rollekonter, made in 1939 at the same time as the original Ricohflex. The camera was perhaps assembled from an unsold Ricohflex body, with the black ROLLE KONTER WORK plate added as an afterthought to cover the words RIKEN KOHGAKU KOGYO CO., LTD. The Rollekonter II has a newer auto-stop mechanism. It seems that all the cameras have a button in the middle of the advance knob, certainly used to unlock the film advance after each exposure, as on contemporary Rolleicord cameras. The cover for that button is often missing on the examples found today. There is an additional control near the advance knob, certainly used to engage the exposure counter after film loading (see below). It is said that the viewing hood of the Rollekonter II automatically comes up when the focus knob is moved, and indeed no latch is visible on the back of the hood. On the model II, the Rolle konter plate around the focus knob normally has a chrome instead of black background. Most Rollekonter II have a large nameplate, similar to that of the model I, marked Rollekonter II and MADE IN TOKYO. However some cameras have different nameplates with stepped sides (see below). The shutter is either the "Tokyo Compur" (T, B, 1–300, sometimes called "New Compur"), or the "Rapid-Compur" (T, B, 1–500), as described above for the Rollekonter I. All the examples of the Rollekonter II observed so far have the U Hitonar Anastigmat 75mm f/3.5 taking lens, though early advertisements give the lens name as "Hitonar" only. The viewing lens is the same U Hitonar Anastigmat, with f/3.5 maximal aperture instead of f/3.2 on the earlier model, and with no serial number. The Rollekonter II was first advertised in the May 1940 issue of Asahi Camera. Early Rollekonter II have a lever in front of the advance knob, certainly to engage the exposure counter. This lever differs from that of the Rollekonter I, and two types are known. The first type is pictured in an advertisement by Mizuno Shashinki-ten dated December 1940, where the lens is mentioned as a Hitonar f/3.5. The second type, with a shorter stroke, appears in another advertisement by Mizuno dated c.1942, and has been observed on at least one surviving camera. The advance mechanism was soon modified. Regular Rollekonter II have a sliding button placed behind the focus knob, replacing the lever of the early cameras. It seems that the back latch became chrome instead of black around the same time. This configuration has been observed on various actual examples, but not on the original documents. Some advertisements by Hakkōdō dated 1941 and early 1942 show a picture of an unspecified Rollekonter model. The camera has a small nameplate with stepped sides (like that of the Rolleicord made after 1938), only marked Rollekonter. It is otherwise similar to the regular Rollekonter II with sliding button. This particular nameplate has not been observed yet on any actual example. The late Rollekonter II have yet another nameplate with small steps on the side, inscribed Rollekonter and MADE IN TOKYO, similar to that of the late Rollekonter A. It seems that the very late cameras lack the K&T logo on the viewing hood. These cameras were probably made after 1943, and the Rollekonter II was advertised until late 1944. The model name "Rollekonter III" first appears in the official list of set prices compiled in October 1940 and published in January 1941, along with the Rollekonter II and Rollekonter B. Curiously, all three models share the same set price of ¥252, perhaps by mistake. The name was used again in advertisements by Hakkōdō dated July 1943 and September 1944. In these documents, the camera is described as "similar to the Rolleicord II" ("ローライコードⅡ型ト同ジ") and listed with a U Hitonar f/3.5 lens and a "Rapid-Compur" shutter to 1/500. The same description is given for the Rollekonter II, only differing by the "New Compur" shutter to 1/300. It is highly probable that this Rollekonter III is the new name of the Rollekonter II with 1/500 top speed, after the model number ceased to be displayed on the nameplate. Recent sources say that the Rollekonter III corresponds to the camera described above as a Rollekonter I with lens casing, similar to the original Ricohflex, but the dates do not match, and this description is certainly mistaken (see above). The Rollekonter B is a less expensive version of the Rollekonter II. It is recognized by its large nameplate, similar to that of the Rollekonter I and II, but marked Rollekonter B and MADE IN TOKYO. It seems that the camera has no auto-stop mechanism, and the film advance is manually controlled by watching the frame counter. The lens is a Hitonar Anastigmat f/4.5. The shutter is reported by some sources as a Light, perhaps giving 5–200 speeds. The shutter plate is marked Patent Pending at the top. The Rollekonter B was advertised from February 1941 to March 1943. An advertisement by Mizuno dated April 1942 supposedly shows a picture of the camera. This picture is certainly a fake obtained from a picture of an early Rollekonter II: the diameter of the lenses corresponds to f/3.5 maximal aperture, and a lever is visible in front of the advance knob, indicating auto-stop advance. Rollekonter A, late nameplate, U Hitonar Anastigmat 75mm f/3.5 taking lens no.15296. The Rollekonter A is an evolution of the Rollekonter II. It has a large casing around the taking and viewing lenses, with a characteristic jagged shape, completely covering the shutter. There is a plate engraved Rolle konter between the two lenses. The speed is set by a lever, and is displayed in a small window on the left of the taking lens (as seen from the front). The aperture is selected by an index, running along a scale on the right of the lens. The shutter is wound by another lever protruding from the casing. The film advance mechanism is similar to that of the Rollekonter II, with a sliding button behind the focus knob. The main release is a small sliding button placed on the camera's left side — as seen by the photographer — towards the bottom. It is said to be very inconvenient to use. The camera has a self-timer, wound by a knob placed behind the main release, and adjustable from 8 to 15 seconds. Another sliding button is visible on the same side, between the self-timer knob and the upper film flange, but its function is unknown. The camera has a pair of U Hitonar Anastigmat 75mm f/3.5 lenses, the same as on the Rollekonter II, with a serial number on the taking lens and none on the viewing lens. Serial numbers have been observed in the 14xxx and 15xxx range. The shutter gives T, B, 1–500 speeds, and was advertised as a "Rapid-Compur". The Rollekonter A was first advertised in August 1942. 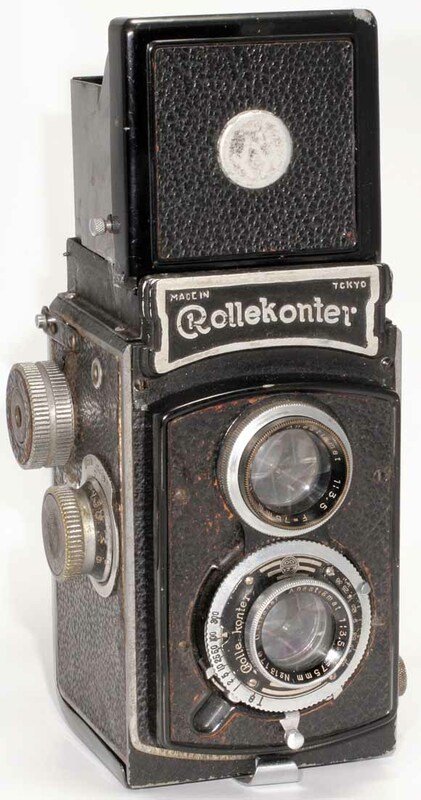 The early cameras have a large nameplate, similar to that of the Rollekonter I and II, inscribed Rollekonter A and MADE IN TOKYO. A picture showing that feature appears in an advertisement in Hōdō Shashin March 1943. (The main release is not visible in the picture, perhaps because of a retouch.) Another picture showing a similar camera appears in advertisements dated July 1943 and September 1944, but it was perhaps outdated at the time. Regular examples of the Rollekonter A have a different nameplate, similar to that of the final Rollekonter II. It has stepped sides, and is only inscribed Rollekonter and MADE IN TOKYO with no indication of the model name. It does not appear in the original documents, but has been observed on various actual examples, including that pictured above. The Rollekonter Automat (ロールコンター・オートマット) is an evolution of the Rollekonter A, only known from an advertisement dated February 1944. The document mentions f/3.5 or f/2.8 lenses, and gives no price. It shows a front view of a camera with a pair of U Hitonar Anastigmat 75mm f/2.8. The picture shows a folded advance crank on the photographer's right and a focusing knob on the left. Two smaller knobs are visible below the focusing knob, certainly corresponding to the self-timer winding knob and the bottom film flange. The nameplate is similar to that of the late Rollekonter II and Rollekonter A, with small steps on the sides and no mention of the model name. The camera has no K&T logo. The lenses are surrounded by a casing, similar to that of the Rollekonter A. The front of the casing is silver-coloured, and the model name is inscribed at the bottom as Rollekonter Auto or perhaps Rollekonter Automat, below the taking lens. There are two wheels at the front, between the two lenses, certainly controlling the speed and aperture. It seems that the settings are directly engraved on these wheels, and cannot be viewed from the top. There is a lever on the left side (as seen from the front), perhaps used to wind the shutter. No example of the Rollekonter Automat has surfaced so far, and the camera perhaps remained a prototype. The Rollekonter was not a cheap camera: the economical Rollekonter B cost only slightly less than the Waltax — a good 4.5×6cm folder with four-element lens — and the Rollekonter A was probably the most expensive camera available on the Japanese market after 1943. ↑ Dates: advertisements and articles listed in Kokusan kamera no rekishi, pp.343–4. ↑ Gyōkai san-jū-nen no ashiato (Feb. 1939), p.13 of Nihon Shashin Kōgyō Tsūshin July 20, 1967, reproduced on p.231 of Hyaku-gō goto jūkai no kiroku: ロールコンターの森製作所. This is confirmed in Tanaka, p.19 of Kurashikku Kamera Senka no.14 and p.132 of Nigan-refu no hanashi (zenpen). The Rollekonter is attributed to "Seibi-do Co. (Mori Manufacturing)" in Sugiyama, items 2021–3. It is attributed to "Rolle Konter Work" in McKeown, p.849, but this is only a dummy name inscribed on the cameras (see Camera Works). ↑ Body casting re-used after the war: Tanimura, p.440 of Kokusan kamera no rekishi. ↑ "Kokusan shashinki no genjōchōsa" ("Inquiry into Japanese cameras"), lens item Lb32. ↑ Tanaka, p.132 of Nigan-refu no hanashi (zenpen). ↑ Kokusan kamera no rekishi, p.343. ↑ Tanaka, pp.132–3 of Nigan-refu no hanashi (zenpen), says that the central part of the wind knob is fixed and the advance is unlocked after each exposure by a lever. ↑ "Kokusan shashinki no genjōchōsa" ("Inquiry into Japanese cameras"), shutter item 18-Q-4. ↑ Example pictured in McKeown, p.849, and example observed in an online auction. ↑ Advertisement reproduced in Kokusan kamera no rekishi, p.105. ↑ Example pictured in Sugiyama, item 2021, wrongly identified as a "Rollekonter II". ↑ Examples pictured in this page, in Neco's collection   , and observed in online auctions. ↑ Example pictured in this page, and example pictured in this page at tlr-cameras.com. ↑ "Rapid-Compur" made by Bikōdō: "Kokusan shashinki no genjōchōsa" ("Inquiry into Japanese cameras"), shutter item 18-R-9. ↑ Example pictured in this page at tlr-cameras.com. ↑ Example pictured in Kokusan kamera no rekishi, p.437, and in Tanaka, p.132 of Nigan-refu no hanashi (zenpen). ↑ Serial number visible in the picture in Kokusan kamera no rekishi, p.437. ↑ Example pictured in Tanaka, p.19 of Kurashikku Kamera Senka no.14 and p.141 of Nigan-refu no hanashi (zenpen). The picture is reproduced in this page of the Ricoh website. ↑ Tanaka, p.132 of Nigan-refu no hanashi (zenpen), and description on pp.19–20 of Kurashikku Kamera Senka no.14. ↑ Tanaka, p.133 of Nigan-refu no hanashi (zenpen). ↑ The lens is called Hitonar in the advertisement in Kōga Gekkan December 1940, reproduced in Kokusan kamera no rekishi, p.105. It is called U Hitonar in the advertisement in Hōdō Shashin April 1942, reproduced in Kokusan kamera no rekishi, p.106. ↑ Advertisement in Kōga Gekkan, reproduced in Kokusan kamera no rekishi, p.105. ↑ Advertisement published in an unknown Japanese magazine around 1942, reproduced in Nostalgic Camera by Toshio Inamura. ↑ Example pictured in this page of D-Grade Camera World. ↑ Example pictured in this page at Galerie Y, and examples observed in online auctions. 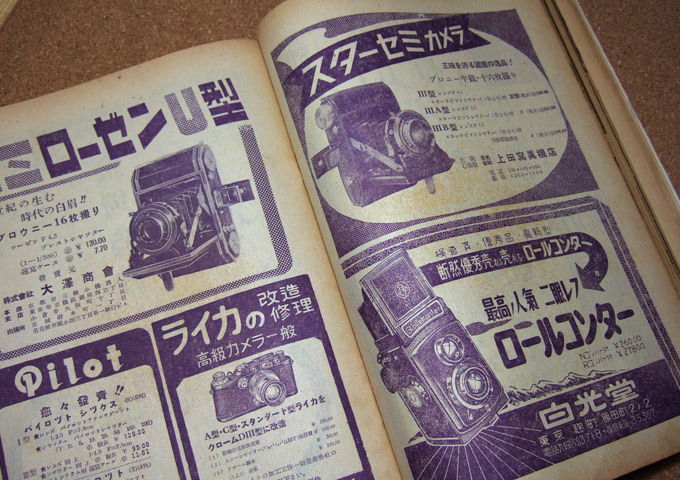 ↑ Advertisement dated 1941 reproduced in Nostalgic Camera by Toshio Inamura, and advertisement in Asahi Camera February 1942, visible in this page of Xylocopal's photolog. ↑ Example pictured in a page of the AJCC, and example observed in an online auction. ↑ Example observed in an online auction. ↑ Kokusan kamera no rekishi, p.344. ↑ "Kokusan shashinki no kōtei kakaku", type 7, section 1. ↑ Advertisement in Shashin Bunka July 1943, reproduced in Kokusan kamera no rekishi, p.106. — Advertisement in Shashin Kagaku September 1944, reproduced at Gochamaze. ↑ Kokusan kamera no rekishi, p.344. The film advance is reported as fully manual via a red window in Tanaka, p.133 of Nigan-refu no hanashi (zenpen), but a frame counter is visible in various pictures. ↑ The speeds are given as T, B, 5–200 in Kokusan kamera no rekishi, p.344, and in Tanaka, p.133 of Nigan-refu no hanashi (zenpen). They are reported as T, B, 5–100 in Sugiyama, item 2023, surely by mistake, and this is repeated in McKeown, p.849. The available pictures seem to show 5–200 or 5–250. ↑ The Rollekonter A is called "Rollekonter A-II" in Sugiyama, item 2022, certainly by mistake. ↑ This page at D-Grade Camera World. ↑ Advertisement reproduced in Kokusan kamera no rekishi, p.106. ↑ Examples pictured in this article, in Sugiyama, item 2022, in this page and this page at D-Grade Camera World, and observed in online auctions. ↑ Advertisement on the third cover of Nihon Shashin Kōgyō Tsūshin, February 15, 1944, reproduced on p.77 of Hyaku-gō goto jūkai no kiroku. ↑ Advertisement in Asahi Camera June 1938, reproduced in Kokusan kamera no rekishi, p.105. ↑ Advertisement in Kōga Gekkan December 1940, reproduced in Kokusan kamera no rekishi, p.105. 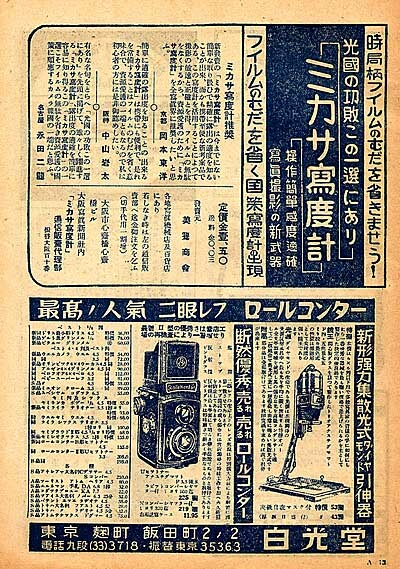 ↑ Advertisement in Asahi Camera February 1942, visible in this page of Xylocopal's photolog. ↑ Advertisement in Hōdō Shashin April 1942, reproduced in Kokusan kamera no rekishi, p.105. ↑ Advertisement in Hōdō Shashin March 1943, reproduced in Kokusan kamera no rekishi, p.106. ↑ Advertisement in Shashin Bunka July 1943, reproduced in Kokusan kamera no rekishi, p.106. ↑ Advertisement in Shashin Kagaku September 1944, reproduced at Gochamaze. "Kokusan shashinki no kōtei kakaku" (国産写真機の公定価格, Set prices of the Japanese cameras), listing Japanese camera production as of October 25, 1940 and setting the retail prices from December 10, 1940. Published in Asahi Camera January 1941 and reproduced in Shōwa 10—40nen kōkoku ni miru kokusan kamera no rekishi (昭和10〜40年広告にみる国産カメラの歴史, Japanese camera history as seen in advertisements, 1935—1965). Tokyo: Asahi Shinbunsha, 1994. ISBN 4-02-330312-7. Pp.108—9. Type 7, section 1. McKeown, James M. and Joan C. McKeown's Price Guide to Antique and Classic Cameras, 12th Edition, 2005-2006. USA, Centennial Photo Service, 2004. ISBN 0-931838-40-1 (hardcover). ISBN 0-931838-41-X (softcover). P.849. Nihon Shashin Kōgyō Tsūshin July 20, 1967. "Gyōkai san-jū-nen no ashiato" (業界三十年の足跡, Records of thirty years in the business). Pp.12–33. Reproduced in Nihon Shashin Kōgyō Tsūshin (日本写真興業通信). Hyaku-gō goto jūkai no kiroku (百号ごと十回の記録, Ten records, every hundred issues). Tokyo: Nihon Shashin Kōgyō Tsūshin Sha (日本写真興業通信社), 1967. No ISBN number. Pp.230–51. Nihon Shashin Kōgyō Tsūshin (日本写真興業通信). Hyaku-gō goto jūkai no kiroku (百号ごと十回の記録, Ten records, every hundred issues). Tokyo: Nihon Shashin Kōgyō Tsūshin Sha (日本写真興業通信社), 1967. No ISBN number. Advertisement on p.77, corresponding to the third cover of the February 15, 1944 issue. Sugiyama, Kōichi (杉山浩一); Naoi, Hiroaki (直井浩明); Bullock, John R. The Collector's Guide to Japanese Cameras. 国産カメラ図鑑 (Kokusan kamera zukan). Tokyo: Asahi Sonorama, 1985. ISBN 4-257-03187-5. Items 2021–3. Tanaka Masao (田中政雄). Nigan-refu no hanashi (zenpen) (二眼レフのはなし[前編], TLR stories [first part]). Gendai Kamera Shinsho (現代カメラ新書) no.68. Tokyo: Asahi Sonorama, 1980. No ISBN number. Pp.131–4. This page was last edited on 2 October 2017, at 10:44.